There’s a strong whiff of the Matrix wafting through Tron Legacy for good and bad. It’s a retro action jamboree, the 80’s nostalgic cyberpunk aesthetic of the original film injected with the best of modern special effects, action moviemaking sensibilities as well as some super hot Tron babes in neon latex jumpsuits. But like the Matrix films, familiar and recycled characterizations renders anything other than the non-action scenes mostly struggle to get through. It’s certainly the best eye-candy of the year, a stylistic extravaganza of eye popping fluorescent duochrome colours as in the original. Like Star Wars, Blue = the good guys, Red = the bad guys. For the few cinephiles who actually remember the old film, back in 1982 the hero Kevin Flynn (Jeff Bridges) was an ambitious video game designer who inadvertently injected himself into the corporate mainframe, a new virtual world where programs were represented by living breathing people fighting the video games for real like gladiatorial death matches. Back then Flynn escaped the computer and exposed the corporate malfeasance of his company. But between then and now Flynn apparently went rogue and disappeared years later never to be seen again. His son Sam (Garrett Hedlund), unfortunately got left behind, and although he’s still heir to the now global media conglomerate, he still desires to complete his father’s altruistic goals of his legacy. A mysterious text message from Flynn sends him back to the old arcade from the first film, where his old transmuting device still operates, which of course, throws him back into the game where his father remains a prisoner. 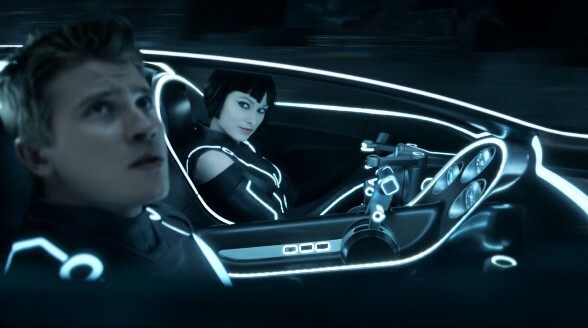 Perhaps the most audacious aspect of Tron is the digitization of Jeff Bridges as a younger version of himself – Clu, a computer program doppleganger created by Flynn back in the day, but who turned on his maker and took control of the virtual world. It’s kind of astonishing what they’ve done. Bridges’ young face looks remarkable, though not perfect and so we can always tells it’s not a human. But since Clu is supposed to be a computer program the CG qualities of his face make the character passable. Though if Clu were in the real world, it would be a different story. The first half of the film features one stunning set piece after another. Like original the first fight for the hero is a flying disc battle. Of course, as influenced by the Matrix Sam’s opponents are now high flying parkour ninjas that can jump and spin and do Hong Kong flips. Back in the day, Flynn’s opponents were just snarling stuntmen in hockey helmets. We also know there’s going to be a light cycle race and Kosinski delivers on making it all as spectacular as can be. His directorial style with the action is precise and could cut glass, complimenting the binary digital technology which comprises the world. Thus the two-colour blue-red system, the endless straight lines into the infinite background and the deep black background, which create a unique depth of field, which actually compliments the 3D process. Unfortunately midway through, Kosinski loses his inspiration and starts leaning on his presumed aesthetic influences, Star Wars and the Matrix. In fact the final act wherein the emotional beats of the grubby and failed father figure Flynn steps up for his heroic young son and confronting his younger former self, reworks the core Luke Skywalker/Darth Vader climax too closely. It’s so rudimentary we don’t care at all what happens to whom. We know exactly what’s going to happen and with Kosinki using up all the best set pieces early, the final moments seems like just a wash of exploding light. But going back to the 3D, it’s by far the best 3D ever produced, a film which reignites my interest in the new medium. Avatar game me a headache. With less colours, less cutting, the simplicity of the design, instead of the two eyes fighting to keep with chaotic visuals, Tron allows our brains to relax. I can go without applauding Daft Punk’s score adds a giddy nightclub quality electro dance pulse which is pitch perfect as well. 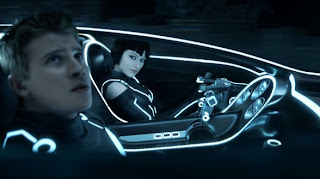 All things considered, Tron is just about as good as it can be, and although it won’t be a bank breaking blockbuster, it should be considered a successful film.